Julie and Phil make up. Danny asks Lucy if Scott was home late last night from his date with Wendy. A man comes to pick Maria up for a date. Danny is shocked. When Maria and the man have left, Danny is very touchy. Wendy comes in and says the man has a great car in the street. Danny is not impressed and storms off to the living room. 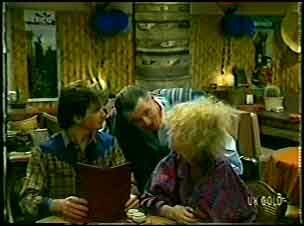 Wendy follows Danny into the living room and asks if they're still going to the flash restaurant tonight. Danny says he can't afford it, but he's got somewhere else in mind. 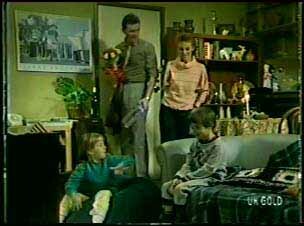 Joan introduces Des to the children and he gives them a jigsaw each. They are very politely-mannered (bless them!) Joan is cooking roast lamb for them all. 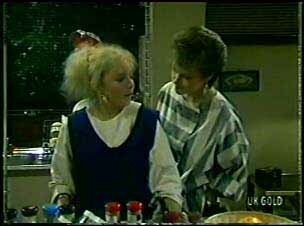 Terry is cooking, but Daphne is going out. They chat about Des and his mystery date. Terry says that maybe Daphne shouldn't move in on Shane so fast - there's a reason why Terry dumped him. She says that Shane is spoilt - his parents have always done everything for him. Once you get to know him you realise he has no goals. Daphne isn't impressed and says that she knows Terry is still keen on Shane. Terry insists she isn't jealous and has no regrets. 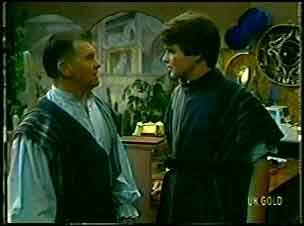 The manager is dressing Scott in a poncho - he's going to be a waiter tonight. He shows Scott how to set the tables. Joan apologises to Des - all they've talked about is her. She wants to talk about Des instead. He says he's the typical mild-mannered bank manager with the occasional girlfriend. He tells her that he was engaged once, but it didn't work out - the girl pulled out. Otherwise he's footloose and fancy-free. Des says the single bit is getting him down a bit and Joan agrees it's not a fun life. Maria comes in late and Danny greets her in his pyjamas. He's very upset and wants to know who the guy was (Robert Hutchings). Maria says he's just a friend. She says that Danny has to trust her - and also that now Max has gone, he must expect her to be in the company of other men. The record has finished and both Des and Joan are very chilled out. They start laughing over a record of nursery rhymes. Lucy has got 9/10 for her project. Jim looks at the pictures and shows Scott the picture of the naked-ish man. Jim says things have changed since he was in school(!). Lucy has stolen a magazine from Scott's room so he snatches it back. Terry and Daphne are wondering where Des is. Daphne is doing her insurance form. Terry asks Daphne what time she came in - she's spelt her name wrong on the form(!) Daphne says she had a great time with Shane. Lucy has done another project with a centrefold. Helen says that she's told Lucy to go all out this time - with a naked centrefold. 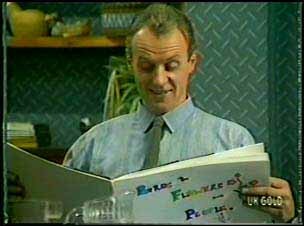 Jim looks trepidatious, but when he open the book, it's a picture of some dogs! They all laugh. Daphne has finished her insurance forms. Terry tells Daphne that Des's bed hasn't been slept in - he didn't come home last night!